Coffee and beer have several dozen similarities worth appreciating and they work as natural complements to one another, opposite sides of the coin that we insert to alter our perception, cognitive abilities, and mood. There is no need to pretend as if either are not mind altering beverages. Let us get that out first, front and center, when it comes to reciting commonalities. One upper, one downer, both over the counter, bar and barista, that in moderation make life tremendously more enjoyable but taken to extreme devalue it. Appreciating a fine cup of Joe requires many of the same considerations as enjoying a good pint of beer. From the appearance, to the feel, the smell, to the taste and resulting flavors, a quality cup of either leaves a ton to investigate and cherish. Beyond the appreciation of taste and flavors we may also investigate the histories of these liquids, juxtapose them against one another, to get a better idea of their origins, creation, evolution, and ourselves. Certainly we stand to be enlightened about our society and species for better understanding how and why a seemingly insignificant cherry pit from the east coast of Africa came to span the globe and dominate the attentions of billions for the centuries. Coffee begins, is discovered and cultivated, in 10th century Ethiopia; makes its way across the Red Sea to Yemen, most likely during the ~50 year reign of Ethiopians; Arab merchants, expansion, and tastes help spread it through the region, though its export is closely regulated and restricted out of Yemen’s trading port, Mocka; the plant seeds are eventually smuggled to India; the Dutch spread it to Java and the East Indies; Europe is introduced to the brew from the 17th century, mostly by way of Turkish influence, including their reversal at Vienna; coffee is initially seen as a miracle drug, something to worry about, and taken to by the upper classes as in earlier places; gradually it takes hold across the continent, nowhere more so than in England, at least until the conquest of India and their general switch to tea; coffee sobers up Europe, powers the industrial revolution, and serves as both energy boost and appetite suppressant for the poor working class; the Dutch, French and Portuguese spread it to the Caribbean and South America, most notably Brazil. The beginnings of beer are a bit murkier. There is a bread versus beer debate as to which was the original motivation for hunter gatherers settling down. Either way, beer has the much longer history, possibly being one of the catalysts for humans settling down to cultivate land and by extension offer a foundation for settlements and civilization itself. In short, the origins of beer span back to prehistory. It was an important part of life throughout the fertile crescent and Egypt (the pyramid builders/slaves were paid in beer). Beer got us to settle down and coffee picked us up. Both coffee and beer are primarily plant products. Environmental characteristics such as climate, temperature, daylight and latitude have a large impact on the crops of hops and coffee beans both. “[F]our basic components … blend to create the perfect cup: aroma, body, acidity, and flavor. The aroma is familiar and obvious enough—that fragrance that often promises more than the taste delivers. Body refers to the feel or “weight” of the coffee in the mouth, how it rolls around the tongue and fills the throat on the way down. Acidity refers to a sparkle, a brightness, a tang that adds zest to the cup. Finally, flavor is the evanescent, subtle taste that explodes in the mouth, then lingers as a gustatory memory. (Pendergrast)” Sound familiar? Bitter, both an appetite stimulant and a digestive [think IPA]. As perishable goods they had built in limits as to how quickly the respective industries could be consolidated. 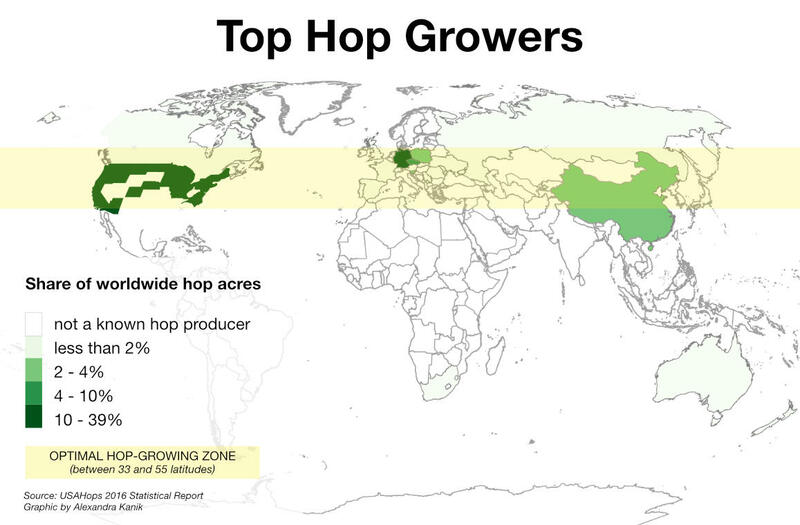 Introduction of hops in European beer over the past 1000 years. Robusta as a metaphor for lager taking over; modernity and mechanization, technology really, sets its own agenda; consumers seek to be/appear modern, for less: mass produced, price slashed, commoditized goods: Wonder Bread, people! Early on, each civilization that got its hands on coffee attempted to control it: Ethiopians, Arabs in Yemen, the Dutch, and French. By the time it set root in Brazil it was clear how futile the attempt was to believe something so desired could be withheld. The old world enlivens the new and the new reinvigorates (remixes) the old: the influence of Europe and the re-pollination of taste when it comes to both beer and coffee. The West Coast as epicenter/capital of both in the US. Dwindling consumption unstopped by advertising. traditional arabica beans such as bourbon and typica varieties; “modern” arabica varieties such as caturra, catuai, or catimor; different varieties and regions of arabica, just as with hops. Is the coffee industry or barometer for what craft can expect? In the US during the second half of the 20th century both beverages saw a resurgence of interest with respect to quality and variety; this started earlier with coffee, no doubt the lingering effects of prohibition, and different legalization hurdles, playing some influence. Today there endless places and opportunities to enjoy coffee. At home, the office, at the library late at night, on a date when you want to pretend you do not spend all of your free time in bars. Go ahead little fibber, put your best foot forward but eventually you will have to show them the real you. Smart to do this gradually, so sip away on your mocha latte cinnamon double decaf espresso milkshake. Fichman, I (Producer), & Lilienheim Angelico, I (Director). (2007). Black Coffee: The Irresistible Bean [TV Movie]. National Film Board of Canada (NFB). By dropping me a message about "Bitter Cousins - Coffee", forwarding to a friend, tweeting about it and/or signing up for the newsletter to receive advance notice of posted content, added site features and opportunities to make suggestions for future data-related beer pieces and miscellany.